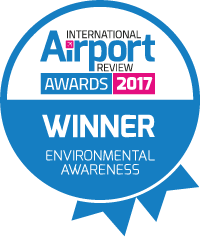 In August 2017, voting closed on the inaugural International Airport Review Awards. Launched as a celebration of International Airport Review’s 20th anniversary year, the Awards are designed to showcase the wealth of excellence, innovation and responsible development in today’s airport industry. It is with great pride that we announce the results. Please click on the categories below to find out more about our winners, or read the full in-depth review in our anniversary supplement. Want to participate in our 2018 Awards? Visit our 2018 Awards page. Everything that happens once you’ve passed through security, an airport’s airside (although not the most visible sector to the passenger) is crucial and often fraught with challenges. The time it takes to inspect airfield lights at Hong Kong International is down by 87 per cent due to a newly-developed automated machine. This commitment to using technology to streamline operations is exactly what International Airport Review was looking for in our Airside Operations winner. The ATC industry is about directing aircraft on the ground and through controlled airspace and providing advisory services to aircraft in non-controlled airspace. To keep our industry safe and operational, ATM should not be underestimated. NATS set about solving one of the biggest challenges to ATC – the effect of wind on landing rate. Their five-year research project and time-based separation (TBS) system meant 62 per cent fewer headwind-related delays at Heathrow. From designing to developing, and building to becoming operational, creating our world’s airports and ensuring they are equipped with the technology necessary to operate is a gargantuan task. To resurface one of the world’s busiest runways without causing any operational is no mean feat. Brisbane Airport managed to achieve this within six months through intense planning and organisational adeptness. Our physical environment is fragile and indispensable – demonstrating environmental awareness is about starting to fix the problems threatening our surroundings and showcasing best practice. Gatwick’s list of achievements in this field is impressive to say the least. As such, there was no one thing that won it, but a combination including cutting water consumption, increasing recycling and bringing in charges for noisy aircraft. From guarding the perimeters, to tracing and tracking passengers, to screening travellers, staff , equipment and baggage, to protecting cyber assets; the security sector in the airport world is never-ending and always imperative. In a competitive field, Heathrow impressed us by bringing in a mixture of technological and systematic solutions to their security challenges. They cut the need for manual handling by officers by 70 per cent, increased Terminal 5 South’s capacity by 12 per cent and improved flow rates from 144 passengers/lane/hr to 165. A technological fix, technical fix, technological shortcut or solutionism is about using engineering or technology to solve a problem – a necessity in today’s airport environment. IATA put forward a solution to the challenges of airside operations training using virtual reality (VR). This solution addresses challenges of space and availability whilst giving trainees an opportunity to experience situations they may not get a chance to in traditional tutoring. The reception, processing, and movement of passengers is all encompassed under the ‘terminal operations’ umbrella. Processes in this category are vital to the efficiency of an airport. Ten major Indian airports have benefitted from a collaboration between NIIT Technologies and SITA. NIIT Technologies optimised operations in a range of ways including boosting on-time performance by 19 per cent at Chennai Airport and paving the way for airport collaborative decision making. From airport charges to non-aeronautical revenue streams, generating the income to sustain our modern-day airports is challenging. This category is about thinking outside the box. Concessionaire Analyzer + developed a platform through which airports can analyse all their non-aeronautical assets from one point. It cuts the man hours required to invoice concessions and allows operators to manage their assets in real time. Passenger experience is about utilising available services and processes to provide the customer with an easy, enjoyable and functional journey through the airport. Perth’s AU$1 billion redevelopment has seen it climb right to the top of the Australian Competition and Consumer Commission’s rankings last year. It has revolutionised its image and facilities to become worthy of the title Gateway to Western Australia.